Meskhenet was the Egyptian goddess of childbirth and destiny depicted as human like goddess with an ancient knife as her headdress that was used as a recognition aid and a device to visually convey the powers, identity and attributes of the deity. Egyptian Name: Meskhenet: Alternative Names: Meskhent and Meshkent. 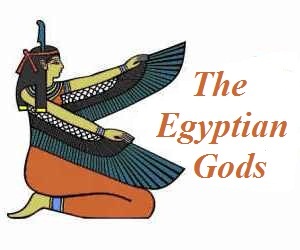 Her name means "birthing place"
Meskhenet, the Egyptian goddess of childbirth and destiny, featured in the stories, myths and legends in Egyptian Mythology. As the goddess of childbirth she was sometimes depicted as two bricks with a human head. These were believed to be magical bricks representing the 'birth bricks' and used during special ritual practices during childbirth. The ancient Egyptian women delivered their babies whilst standing, kneeling, squatting, or sitting on their heels on birthing bricks, or sitting on a birthing chair. The birthing bricks that ancient Egyptian women used during the final stages of childbirth, measuring 14 by 8 inches long and decorated with painted scenes and figures of the birth process. 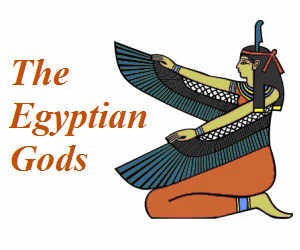 After a child was born, Meskhenet carried out her duty as a goddess of destiny and predetermined the life of the child. The ancient Egyptians believed that their fates were recited over the birth bricks and that these fates were also inscribed on magical birth bricks. The role of Meskhenet in relation to destiny and her association with Shai and Renenutet is believed to be the basis for the ancient Greek goddesses called the Three Fates (Moirae) were reputed to be the personification of destiny, the weavers of fate who determined when life began, when it ended and all that happened in between. There were many versions of the Book of the Dead, the following picture is taken from a Book of the Dead commissioned by a royal scribe called Ani. Ani is depicted with his wife moving towards the the scales of truth and the ceremony of justification in the Hall of the Two Truths. During the ceremony the heart was weighed on a set of scales against the feather of truth when the fate of Ani would be decided - either entrance into the perfect afterlife or to be given to Ammit, Devourer of the Dead. Ani, accompanied by his wife, is seen standing with head bent low in adoration at the side of the Balance. Between Ani and the scales stand the two goddesses who nurse and rear children, Meskhenet and Rennet (possibly Renenutet). The role of Meskhenet was to ascertain the suitability of Ani to enter the paradise of the Afterlife, a representation of a symbolic rebirth in the Afterlife.